Remote, harsh and full of mystery…this is the image that appears in people‘s minds when they hear about the legendary Kamchatka, located in the far eastern corner of Russia. 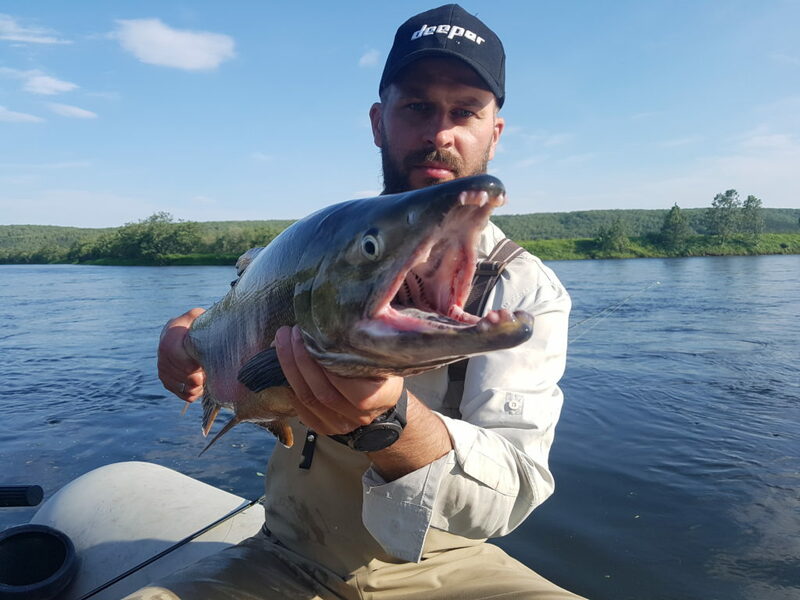 However, it is not unusual for professional and amateur fisherman alike, to take on the challenges of exploring this land, mainly due to the famous King Salmon, native to Kamchatka‘s waters. There are various ways to get to Kamchatka from Lithuania (my homeland). We chose the most convenient route – flying from Kaliningrad via Moscow and then on to Petropavlovsk. The combined duration of flights took over 17 hours. We landed at Petropavlovsk airport, where we were met by our guide. 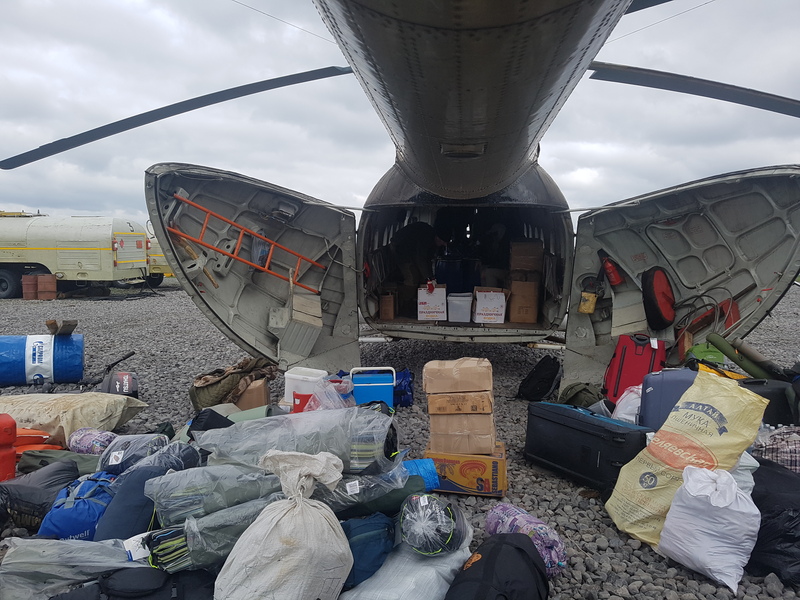 We still had an 8-hour-long bus ride ahead of us, as well as a helicopter flight in an unknown direction. We could only hope everything would run smoothly. Finally, after a long and tiring, but thankfully, smooth journey, we arrived at the camp that was to be our home for the next week. The purpose of this trip was one – King Salmon, the largest in the world, a dream for so many fishermen and Kamchatka‘s pride. 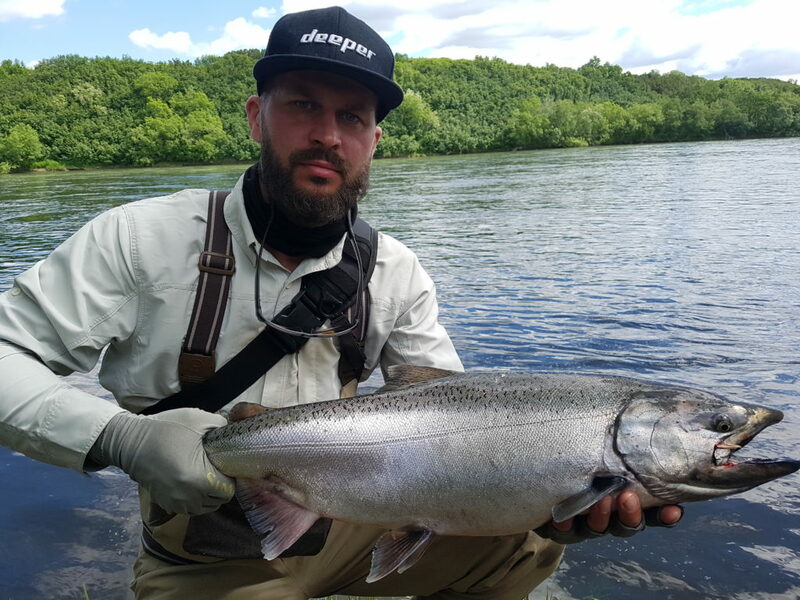 Kamchatka is definitely a destination that every fisherman must visit at least once in his lifetime. Fishing here is a truly unique and unforgettable experience. Of course, our anticipation was building and we were itching to go fishing after our rather long journey, so our mood was quite euphoric. Our first attempts were, indeed, successful. In fact, within the first thirty minutes, all of us got to experience what it‘s like to catch A Big Salmon. It seemed like there were so many fish, that hardly any effort was needed to catch them. I have to admit, we were lucky in terms of weather and location, they were perfect! Anyway, our first impression was positive and our morale was high. After my initial catch, I realized that one has to be well prepared for this kind of fishing – these fish are big and they are powerful. If we talk about the most popular species of Kamchatka fish, King Salmon is definitely number one. Dog Salmon comes in second, followed by some other local species like Rainbow Trout and Greyling. So, while waiting for King Salmon, we would routinely catch these other fish. We soon got used to them, our initial joy and excitement fading as we remembered our main goal, the reason why we had come all this way, the King Salmon. Having calculated and timed every detail of our trip, we knew this time of year would produce beautiful fish, silvery and rich in color. King Salmon make their way right through the middle of a river, pushing other species out of way. Our fishing technique looked more or less like this: we aimed for the middle of the river hoping to catch a King Salmon, and then, if it didn‘t work out, we tried again closer to the river bank hoping to a get smaller fish, such as a Dog Salmon. If we didn’t manage to catch a Dog Salmon either, then we were left with Rainbow Trout or Brook Trout, and our last hope, a Greyling. 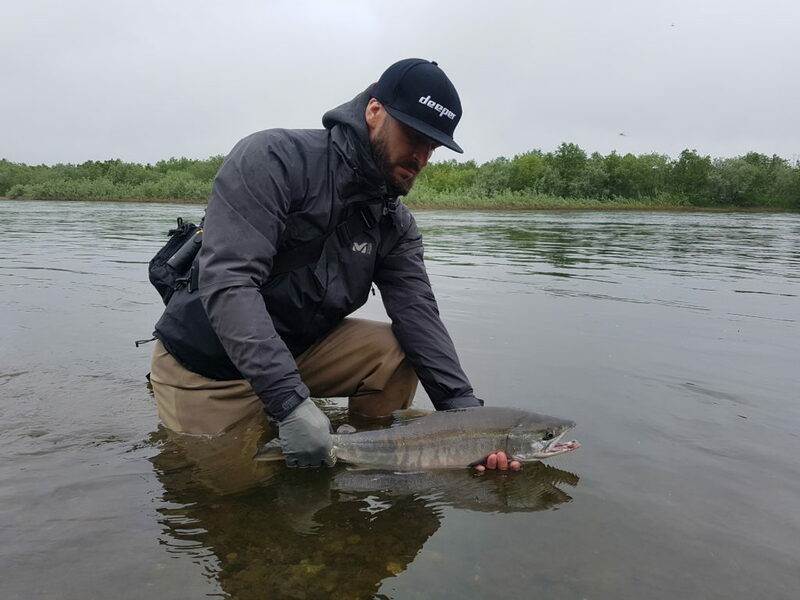 Of course, the little fish are much less exciting than the King Salmon, however, here in Kamchatka, even Greylings will impress you with their size. The salmon gathered in the main current, especially in the confluence of two rivers. This is where we were mostly trying our luck. A peculiar thing in Kamchatka is that sometimes fish gather in very still waters, where you’d least expect them. The Deeper smart sonar was very useful in this case – several times we were not sure about the depth of a pit. With the help of Deeper, we saw that it was much larger and deeper than our guide believed it to be, and we found lots of fish inside. The sonar ended up being an invaluable tool and were happy that we included in our fishing arsenal. What bait was best? We used lures. The fish were mostly caught in the main current, so a wobbler worked well. Lures are good even when the current is very powerful and also work well fishing from a boat. Local fishermen used spoon baits, but for some reason, they did not work for us. By the way, it is important to keep in mind that when a King Salmon is on your line, it resists so much that you feel like your fishing rod is being ripped out of your hands. When you get this rush of adrenaline, you have no doubt about what kind of fish is on the other end of the line. Challenges? Grizzly bears. There are plenty of them, literally breathing down our neck. They wanted us to know whose boss. 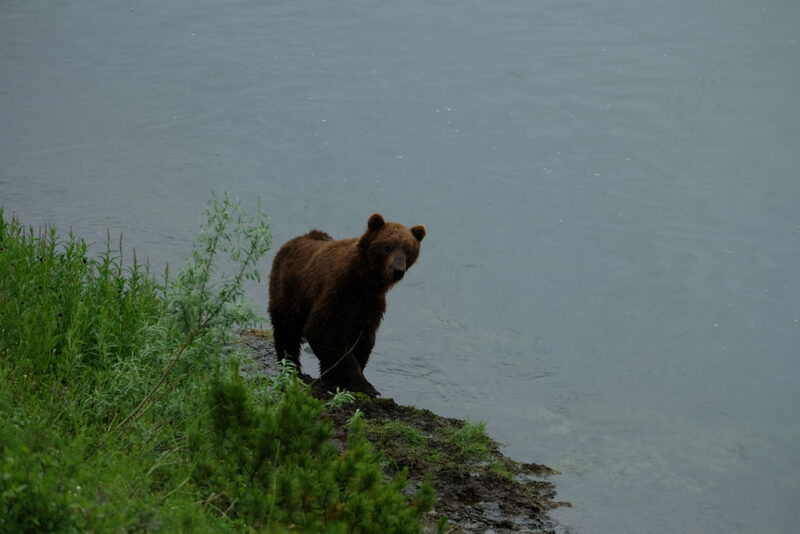 We were accompanied by bears from day one and we knew we had to be extremely careful. Our guides advised us to feed the bears a little, so they would not be hungry and feel the need to snoop around our campsite. We followed our guide’s recommendations – we would leave smaller fish approximately 300ft from our campsite. We also took turns standing guard and keeping watch over the territory throughout the night. Cleary, we made it out unscathed. Successful? Absolutely. We caught (and released) over a hundred King Salmon. My biggest catch was 20lbs, but my buddy caught one over 38lbs. We came back with a pocket full of memories, not only because we encountered fish of impressive proportions, but because the overall experience was one of a kind. There are no words to describe the natural beauty of raw wilderness. 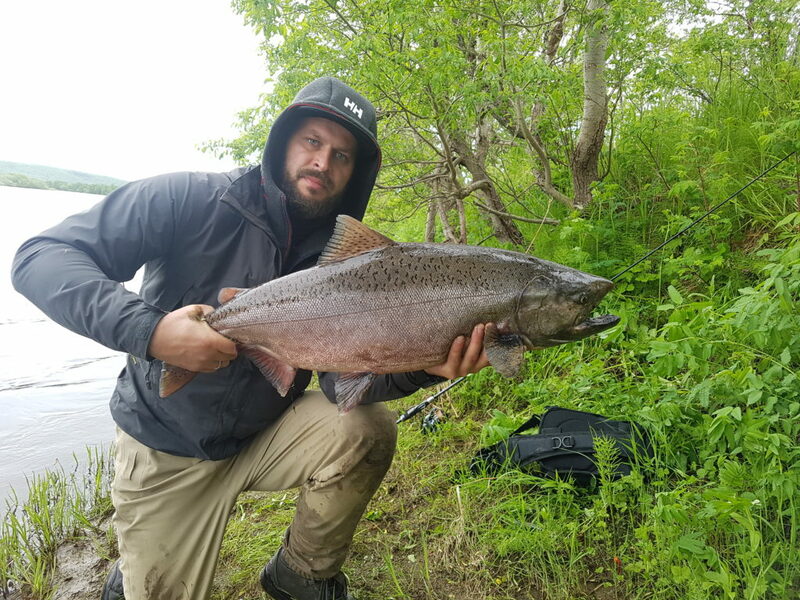 It can be said that a trip to Kamchatka is a fisherman‘s dream, and if you do it once, you’ll want to go back and relive this amazing adventure, once again.